Enemy was released earlier this year and made a splash with critics, but not necessarily with audiences. Since its release, it has begun to gain a cult following. The film tells the story of a seemingly uninteresting history professor, who after discovering that he has a doppelganger who is an actor, begins to obsess over him and eventually interfere in his life. The film is based upon the novel “The Double” by José Saramago and is essentially a thriller on the surface, but with something going on underneath than its genre title that’s far more intriguing. Watching this film the first time through, you definitely start picking up on some rather strange things. One side of you will be attempting to work out what’s going on in the story, but the other will be second-guessing everything and wondering if there’s anything more to it than what’s on the surface. That’s when you start thinking about things like symbolism, and how it relates to the story being told to you. And the great thing about this film is that there is no concrete answer. There isn’t one simple explanation, and viewers can put their own interpretation on what it all means. However, I think this is one of those films that will generally piss off a certain type of audience. This isn’t a film that spells anything out. If you aren’t paying attention and you’re just focusing on the story itself, then the ending will be a complete and utter shock to you. A lot of audiences without open minds will probably just want to see this because of Jake Gyllenhaal’s performance, which they have every right to do. He IS fantastic in the movie, but when the film’s intended purpose kicks in, they won’t know what to make of it. That’s okay though, because this isn’t a film for everybody. 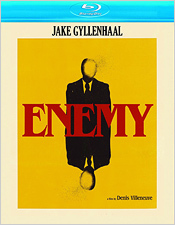 Enemy is a film that’s entirely different from what you would expect it to be. A lot of people won’t know what to make of it and accuse it of being boring or convoluted, both of which are incorrect. It’s simply a complicated piece of work, rather than a straightforward thriller. It takes a little more brain power than usual to work it all out, but it’s very rewarding when you do. If you’re a fan of either David Lynch or David Cronenberg, then you owe it to yourself to see it. For me personally, I felt traces of Mulholland Drive and Naked Lunch, which isn’t a bad thing. Shot digitally, Enemy looks really great, but it dips slightly in the fine detail apartment. The color grade for the overall film is such that it appears in a very tinted yellow/red/orange hue, which is intentional. Some of the very fine detail is lost because of this, especially in wide shots. Close-ups looks great most of the time, showing off more detail. Blacks are very deep, but they also soak up a lot of detail because the film is so dimly lit most of the time. Contrast is great, but the overall brightness level (or dimness, I should say) is a little hard to take at first. Again, it was an intentional choice on the part of the filmmakers. I didn’t notice any digital anomalies to speak of, so we’re good there. The film’s soundtrack, which is a single English 5.1 DTS-HD track, is quite good without being overly aggressive. Dialogue is always clean and precise, as is score and sound effects. There’s some nice ambiance in the surrounding speakers with some light directionality and a bit of low end for key moments. So it’s an immersive experience, but not overly. Subtitles are also included in English, English SDH, and Spanish for those who need them. The sole extra is a nearly twenty minute featurette entitled Lucid Dreams: The Making of Enemy. I have a feeling that this film will be talked about quite a bit in the years to come. It’s certainly an experience that you don’t get too often. It has some great performances, but is quite cerebral when it comes to the story and the elements contained within it. Again, it’s not for everyone, but I urge you to check it out if you have a brain that doesn’t mind doing all the work.